Is it time to clean your HVAC system? HVAC Cleaning Tips Whether it is the middle of the summer or winter, you are going to be using this system on a regular basis. This happens all the time and that means you will want to clean up. To do this the right way, you will want to think about the following HVAC cleaning tips. This advice will let you focus on how the system is running without worrying about its longevity. This is one of the biggest mistakes people make with regards to their HVAC systems. You want to run routine inspections whether it is time to clean or not. The idea of running a routine inspection is to make sure you are on the right path. Otherwise, there is going to come a point where the inspection doesn’t work out as you want it to. Routine inspections are a wonderful way to determine what is going on in the system before it starts to give issues. This happens all the time and a bit of foresight on your part is going to go a long way. The first thing you want to do is to take out the grills and give them a good cleaning. How are you going to do this? You will want to tag a small rag and a bit of vinegar to rub on the grills. This is going to help get the debris off as you wash it down with water later on. Remember, you want to allow the grill to dry in the sun before putting it back on. This is to ensure it doesn’t cause damage to the HVAC system. The grill is an integral part of the filtration system and you want to ensure it is in good shape before putting it back on after a cleaning. 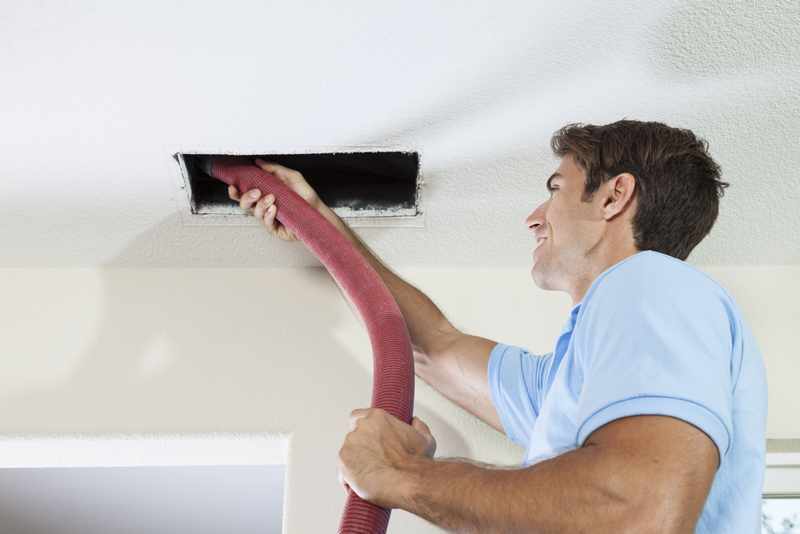 If you are going to be cleaning out some of the debris in the ducts then it is time to take out your vacuum cleaner. The long hose is going to let you reach deeper into the ducts so you can work on the dust that has started to accumulate. This is an important part of the cleaning process and isn’t something to ignore. If you ignore it, there is going to come a time where the debris or dust will start to create blockages. This is when things go awry and you don’t like the final results. There are times when you can get away with a simple cleaning but you will have to make a call in this regard. For example, is the air filter starting to look awful in terms of its condition? Do you think it is time to make a complete change? You should be changing the air filter at least once a year and it should be done on a set date. However, a lot of property owners prefer to make it a semi-annual task as that ensures their HVAC system is in good shape year-round without any unnecessary issues. With this list of HVAC cleaning tips, you want to make sure to remain as methodical as possible. In fact, this is one of the reasons HVAC systems start to break down early on. If you are not methodical with the cleaning and/or maintenance then it is going to end up biting you in the back later on. Stay on top of this as soon as you work on the HVAC system. This is the only way to ensure it runs in tip-top shape at all times of the year without falling apart. As long as you follow these HVAC cleaning tips, you are going to be in good hands and you will see the results that are necessary. No one likes a system that is starting to make rattling noises or is not functioning the way it is supposed to. You have to be smart about what you are doing as that is one of the most important requirements in the modern age. Be smart and you are going to enjoy the cleaning as much as you want to. New York, NY. All Rights Reserved. "United Air Duct Cleaning is a family owned business, our company's identity has recently been spoofed, we do not use the method of Telemarketing or Robocalling to inform people of the services we provide. We are currently working on resolving this matter. If you have been contacted by a telemarketer or Robocall on behalf of our company please contact the FCC to file a complaint." "United Air Duct Cleaning is a family owned business, our company's identity has recently been spoofed, we do not use the method of Telemarketing or Robocalling to inform people of the services we provide. We are currently working on resolving this matter. If you have been contacted by a telemarketer, or Robocall on behalf of our company please contact the FCC to file a complaint."